This article originally ran on December 12, 2016. The other weekend, I was the first to arrive at a holiday party and the hostess was having a ham emergency. “Do I follow the instructions that came with the ham or do I follow the instructions that came with the recipe?” she asked. We were standing in our socks in her kitchen, staring at the ham, pink and faintly glistening. We thought about it, consulted the internet and reassured ourselves that yes, the ham was already cooked so there was no need to really worry about anyone dying from the ham. It just needed to taste good. The glaze — orange juice, mustard, garlic, olive oil and brown sugar courtesy of my queen and yours, the Barefoot Contessa — smelled good but looked quite bad. Still, we glopped it over the ham, and put the thing in the oven for an hour. When it came out, it was beautiful: burnt in places, burnished brown in others, studded with chunks of garlic here and there. I hacked it at halfheartedly with a chef’s knife, arranged the “slices” as prettily as I could and walked them out to the living room. “Oh my god, there’s a ham!” someone exclaimed. Parties are great because seeing humans that you ostensibly care about while wearing a sparkly top and holding a wine is one of this world’s greatest pleasures. Plopping down a ham on a table next to a bag of King’s Hawaiian rolls is a neat party trick, and one that will make you feel lie you’ve done something really, really impressive when all you did was rub some stuff on a ham, put it in the oven and walked away. Ham is one of the few things you can make for a gathering that looks impressive and costs very little. A spiral-cut ham, already cooked, usually costs $1.49 per pound and is readily available in the very same grocery store where you buy everything else. A six pound ham is sufficient; if you want leftovers and also want people to be extra amazed, a 10 pound ham is a nice compromise. 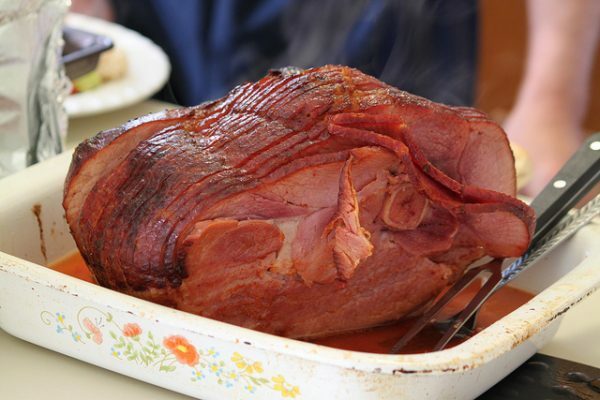 It looks like it took all day to make because no one really gets how a ham is cooked. The size of it presumes time and effort, a multi-day affair that involves marinating and rubbing and diamond-shaped incisions stuffed with cloves. Let people think it took more work than it did. Bask in that recognition. You’re having a party, which means people are at your house and will be there for a while. You’re dressed and standing and drinking a white wine in the kitchen with friends, picking at the ham. “I can’t believe you made this!” someone will say, and you will smile and nod and demur. It took no time. It cost less money than two bottles of wine and a bag of fancy cookies. It is delicious and warm. Everyone’s impressed; everyone’s happy. You did it. Megan Reynolds is a former Billfold editor. She’s now the managing editor at Jezebel. Photo credit: Anthony DeRobertis, CC BY-SA 2.0.